Here it is...what so many of you have been waiting for...Liz Lazo presents her Vintage Canvas for upcoming Craziness. 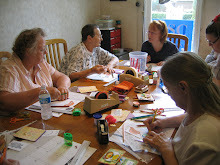 This workshop is Saturday morning, October 11, from 9:00am - 12:30pm and there are still some openings in her class. Read the workshop description at www.cootiecoocreations.com and see if this isn't the perfect gift to make for the approaching holiday season! OMG, CRAZINESS is just THREE weeks away - whoop whoop!